When you have been injured in an accident, you need to secure legal representation you can put your faith in. 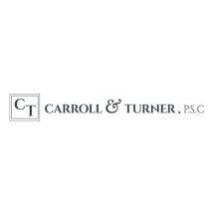 The personal injury lawyers of Carroll & Turner PSC, in Monticello, have more than 45 years of combined experience fighting to help those who have been injured. How Will You Deal With The Difficulties Caused By Your Accident? Are Insurance Companies Treating you Unfairly? Too often, people come out of accidents with serious injuries that have huge impacts on their lives. They may not be able to work. They may not be able to provide care to their children or other loved ones. They may need extensive medical care. People often do not know how to respond to all of these needs. The simple fact is that compensation is essential for helping people overcome the obstacles their injuries have created. Whoever caused your injuries should be held accountable and should fully compensate you for all of the ways they have harmed you. Our attorneys have won multimillion-dollar verdicts, the largest at $20 million. We have been able to generate these results for our clients by providing highly effective representation. You do not have to face the challenges caused by your accident without support you can depend on. The personal injury attorneys of Carroll & Turner PSC are committed to helping people just like you through the most difficult times. To schedule a free initial consultation, call 606-536-4133.